We carry a wide selection of extra-large walk in tubs for the elderly and disabled. The 32” x 60” walk in bath is spacious and designed with plus sized bathers in mind. The extra-large walk in bathtub has a wider internal seat width allowing for bigger bathers to sit down more comfortably. It is important to measure the bather and the internal dimensions of the tub to get a good approximation of sizing. Bathers of all sizes might just enjoy having the extra space that this tub offers. Aging Safely strives to offer oversized and compact walk in tubs that are of the highest quality standards. If you’re looking to find an extra-large walk in bathtub, you will want to consider the HD3260 series. This step in tub has ample area to soak in. Larger bathers will enjoy not being cramped into a small walk in tub. The extra room allows for the bathers to have a little more elbow room and be able to have a deeper soaking experience. Many bathers may be able to completely submerge their shoulders into the water with this oversized walk in bath. 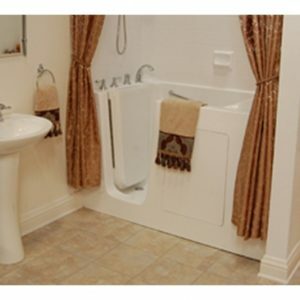 Our step in bathtubs for seniors are designed specifically for the elderly and disabled. The senior baths have a low step in to make getting in and out more manageable for some bathers. The fixed seat makes it possible for bathers to rest comfortably while taking a nice warm bath. This bathtub comes with several safety features you will appreciate. Internal grab bars, low step in, textured flooring and temperature controls. See why people all across the country have chosen Aging Safely senior step in tubs.